The delegate chalked out ways to protect vulnerable farmers along with PITB. Moreover it figured out tech-based insurance solutions to uplift farmers and agriculture business. 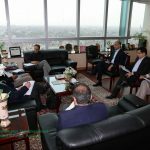 DG IT Operations in Punjab Government, Faisal Yousaf enumerated PITB’s accomplished technology derivatives devised for agriculture sector. Further he informed that PITB has been compiling an exhaustive list of farmers and currently there is a database of 3.8 million registered farmers. Financial institutions are lending money to the farmers on easypaisa pattern. PITB is building an agricultural ecosystem to facilitate and encourage investors and businesses. PITB is working with Agriculture department, food department and board of revenue to accumulate farmers database. Salman Amin, Project Director PPMRP says that PITB’s ICT’s aim at monitoring resources, gauging performance and helping informed decision making and PPMRP is helping agriculture department to record digital map of farmers. Senior Insurance Specialist, World Bank, Vijayasekar highlighted the need of PITB’s technology assistance to ensure transparency in agri-insurance along with PITB’s help to develop a version of IT platform that integrates land database and insurance mechanism. PITB’s Chairman, Dr. Umar Saif proposed technology based agricultural insurance solutions. He welcomed World Bank’s proposal of an integrated platform for agri-insurance. He stated that PITB is offering interest free loans to farmers through smartphone mechanism. 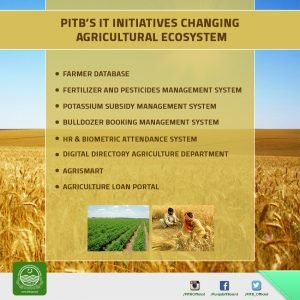 World Bank appreciated the technology initiatives of PITB for agriculture and revealed their excitement to team up with PITB to build innovative technology platform to uplift farmers and agri-business.